That's the only slanted-pup MG I've seen other than the usa MG112 in the catalogs. Not too many MGs around with that pickup configuration. Pretty cool. Hi darren, done a bit of digging on this. Evidently the Model designation is MGX-NM, this is on a neck sticker on the only other model the same as this, which has recently been sold in the UK. Heavy build, it weighs in at four kilos, but balanced very well. True not many slanted bucker MG's around. I have a NOS USA swamp ash body and bound MG neck that someday I'm going to build out. Note the bound board and that the nut has never been slotted! Hi Ascension, now that IS a nice project,I hope you get the time to build that. I for one would be interested in seeing that progress. I know you are up on the specs on the Mercury series, just wondering if you've ever seen another MG model either USA or import with a reversed headstock?? As for the reversed headstocks, I have seen one 24 fret USA and three import MGs with reversed headstocks. I don't think there are too many floating around. Sorry bro for the late resonse I have been out of pocket for a while. No I haven't seen one with a reverse headstock. Tonight I scored this on ebay 92-93 MG 104 body! Who has a USA 24 Fret neck?? 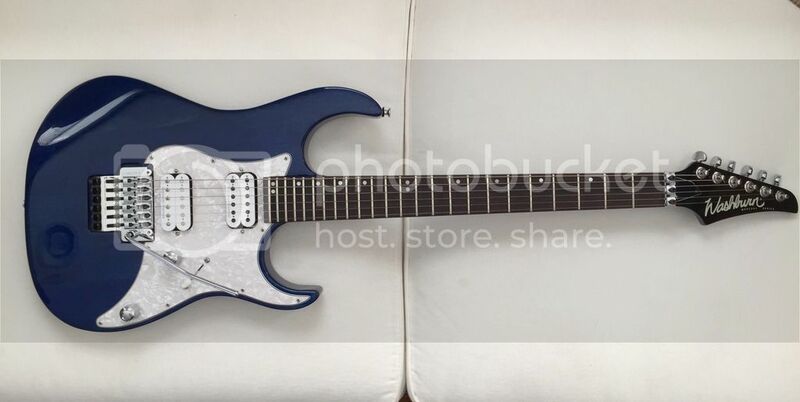 Did you ever find out anything about this guitar. I have one also and was wondering the same thing. 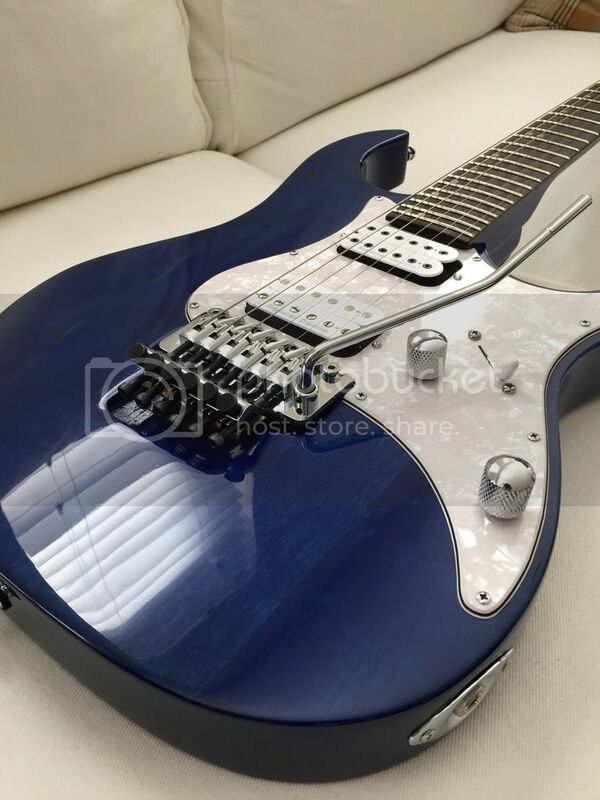 I've heard that they were made in the Samick plant in Korea around 1992-1993, maybe as a run out model?. I've also heard that it was designed by Grover Jackson. The Mercury MG-42 was my first guitar my mom got for me and I played the heck out of it for 20 years. However, I never took the time to really care for it growing up as I knew how to play, but clueless when it came to setting up. I picked up a Parallaxe last year and knew if I didn't do anything with the Mercury, she was going to collect dust and I didn't want to sell her for chump change as it's sentimental to me for being my first axe.... Everyone remembers their first! One major issue I found with the Mercury is that the lower FR post hole wasn't to spec from the nut, about a couple millimeters longer. At some point the post broke into the block cavity and answered my question of why my lower strings had such crappy sustain. I filled the post holes added additional wood in the block cavity and drilled away. I ordered a Gotoh FR (GE-1996T) which has larger diameter post mounts. These wouldn't work because there's not much wood in this area. So I sold those and got the standard FR mounts which work great. If anyone is interested in upgrading their FR, I suggest getting a Gotoh as it's a direct swap for the 600s that was standard on Mercury. Also, a 40mm block will fit that really helps the sustain. The only items that are original is the body, neck, and rear cavity cover. I stained the body and neck with Transfast blue powder and also mixed blue stamp ink to give it more pop. The finish includes many coats of Deft. I redid the frets myself and while studying on this task, seemed quite difficult. However, it takes patience and if you have it, it really pays off. I've added a super 5-way switch to compliment the SD Distortion trembucker and Full Shred humbucker. I've since swapped out the Full Shred with a Screamin Demon in the neck and haven't put it down since. However the Demon is black and is not aesthetically pleasing so I'll be looking for a white one. Overall, took roughly 8 months of on and off work, and I probably dropped $600 into it which is high, but compared to buying another axe, you can't touch the upgrades that I've added for that price. 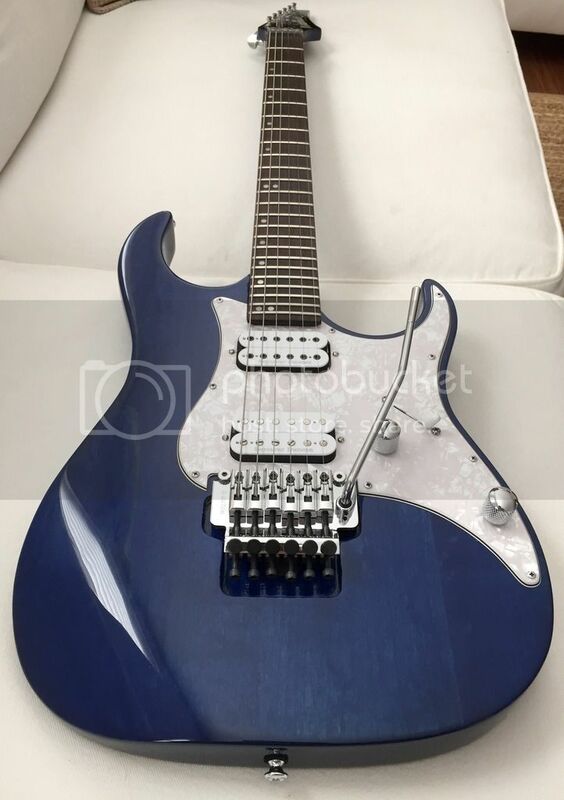 Anyways, I'm happy that there are Mercury enthusiast out there as this is such a great axe and like many have agreed, Washburn needs to manufacture a line of these again. My stepfather has a wide collection of guitars from PRS to a 1969 Les Paul and he always wants to play the Mercury when I bring her over. 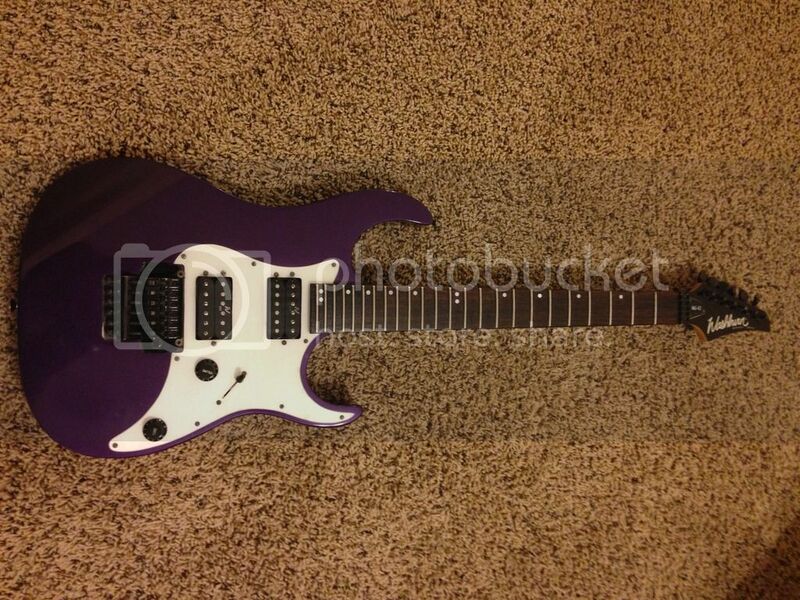 I have a trans purple 92 MG74, also came without a pick guard. 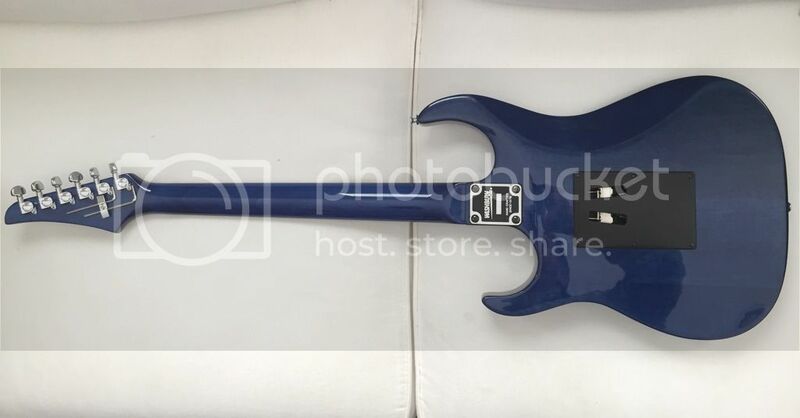 Anyone know why these seem so rare, never seen a spec that didn't include the pick guard. I just acquired a Mercury II Series, SN 4011640.It has Washburn 511, 512, 523 pus, and Washburn bridge that is missing its tremolo arm. No other markings on guitar.... Any help with model number, vintage, and source for tremolo arm would be appreciated. Lets try and resurrect some MG love here! Any of the old USA MG lovers still hangin around over here? I have a few Mercuries, none of them USA Models. I have been playing them onstage for years and buy them cheap, and often refret them as well since most have been heavily played which is a testament in itself. Occasionally I have to do trem post resets, but not often. Even for an overseas model, very well built.